Alphabet Book - Garfield the Cat introduces the alphabet. Use these letter booklets to identify letters, identify phoneme, write the letter and more! Authentic American English Pronunciation - ( Fantastic site ) Lessons are available on quite a few topics. Each lesson provides the pattern, gives examples, provided practice (a lot of practice), and ends with a quiz. Each word in the quiz can be pronounced for the student by clicking on the speaker icon. This site would be good for Language Arts or ESL classes. BBC - Interactive Language Arts Lessons at the BBC - Reading, writing and spelling and grammar skills can help you tell a story, share your ideas, write a letter and make sense of instructions. 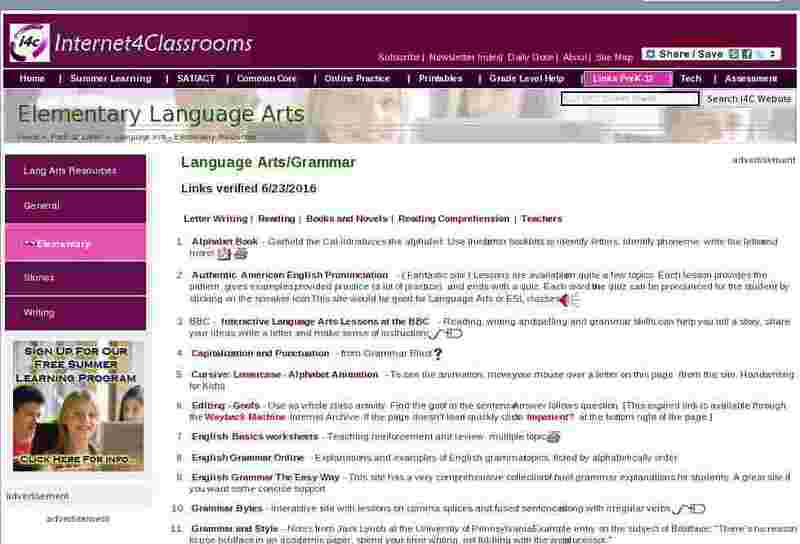 English Grammar Online - Explanations and examples of English grammar topics, listed by alphabetically order. English Grammar The Easy Way - This site has a very comprehensive collection of brief grammar explanations for students. A great site if you want some concise support. Grammar Bytes - Interactive site with lessons on comma splices and fused sentences along with irregular verbs. Grammar and Style - Notes from Jack Lynch at the University of Pennsylvania. Example entry on the subject of Boldface; "There's no reason to use boldface in an academic paper; spend your time writing, not fiddling with the word processor." Harcourt Language Site - Many activities to practice grammar skills, vocabulary, and writing. Some activities are online quizzes. Long vowels - Ten colourful poems (this is a UK site) with animation, audio and activities - featuring Daisy the snail, the toad and the goat, and friends. Quia Language Games - Tracy Gefroh Boyd, M. S., CCC-SLP has created many language activities for her Speech and Language site. Word Game Time - Your destination for the best language arts games and homework help online. Our games are FREE, fun, trustworthy and approved by educators. WyzAnt - many resources to help you with that pesky grammar rule or give you the writing tip you need to make your essay top-notch! Letter Writing - Tips for writing letters and a letter templates. Compass Learning Sample Activities - Grades K-8 sample activities. Scroll to your grade level. Also has Math, Science and Social Studies games. Idioms - Concentration style game. Words and Pictures - These games and activities from the BBC will make learning phonics fun. Word Walls - Everything you need to create a wall of sight words is available here! Pre-primer through Third grade! Books - Garfield Think-Aloud Series - "Help learners use effective reading strategies purposefully and independently." Teacher materials and student material and assessment options. Book Wizard - Search tool that will create individualized reading lists based on interests, reading ability, and age level. Literactive - Free registration, poems, books, worksheets to go along with stories, audio- poems and books can be listened to or read by the student. Novel Guides - from Classzone; activities and suggestions for novels. Novel Guide-Novel Analysis - literary analysis on the web; an educational supplement for better understanding of classic and contemporary Literature Profiles, Metaphor Analysis, Theme Analyses, and Author Biographies. Novels - Teaching Guides - from Harperchildren; " include general discussion questions and suggestions for reaching across the curriculum: math, science, language arts, music, and social studies." Novels - from ProTeacher; click on the Activities by Title to find resources for a particular book, or click on the other links to find other great resources. Online Children's Stories - There are a lot of stories available on the Internet to read or download. Some of them are from well-known books, others can be found only online. Reading Units - Chapter books with lesson plans, vocabulary assignments and more. ReadPrint - free online library, thousands of free books. Practice Reading Test - 2nd Grade; read online story and answer questions; print out answer sheet to check at a later time. Reading Comprehension worksheets - This section features all new weekly worksheets, provided free for teachers and parent-teachers to copy and use. They are most appropriate for the upper elementary and middle school years. RepeatAfterUs - On-line stories with audio to read to the students or have them read aloud all together. See it, Say it, Write it - Great site for sequencing and non-stove cooking! Tameri Guide - Calculating Reading Levels - Tools for calculating reading levels - a series of methods whose functions are used to determine the reading levels for different student age groups. Readability Tests Interpretation - Learn to interpret the tests. The Compact for Reading Guide is a user-friendly handbook designed to walk your family-school compact team through the steps of building and implementing a Compact for Reading. It provides information, strategies, examples, and checklists to help parents, educators, and community members develop effective, workable compacts that can improve your school, increase family involvement, and increase student skills and achievement in reading. Preventing Reading Difficulties in Young Children - The focus of this report is prevention. The report sketches a picture of the conditions under which reading is most likely to develop easily - conditions that include stimulating preschool environments, excellent reading instruction, and the absence of any of a wide array of risk factors. Starting Out Right (A guide for promoting children's reading success) - Parents want to provide their preschool children with a good start in literacy. A school district tells its teachers to change the way they teach reading. Preschool caregivers want to be sure that the children they care for are ready for school. A mother attending a school meeting hears confusing messages about the best way to teach beginning reading. A corporate executive wants the company to support an after-school tutoring program, but is not sure where to start. This book is for all these people. It is written particularly for parents and others who can influence the education and development of young children, especially policy makers, caregivers, and teachers.